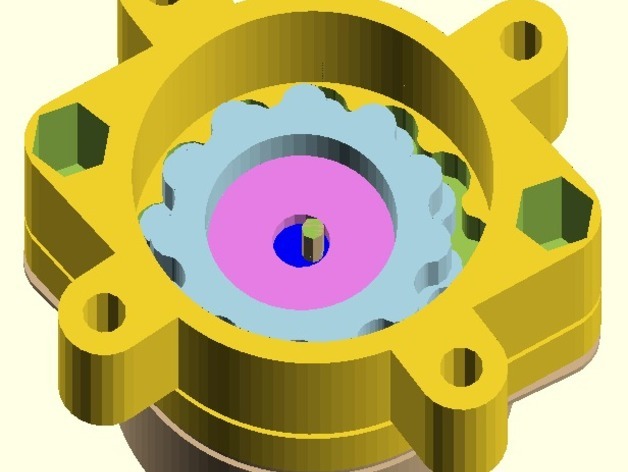 This is a differential cyclodial gearbox which achieves a large ratio by a similar mechanism to the "split planetary" gearbox, but with far fewer and much less delicate parts. I did not want to put four little, fragile pins on the inside of the gear as pictured in most cycloidal solutions. It is designed so that the output is co-axial with the input, letting everything load-bearing easily sit on ball bearings. 2 X 12mm M3 screws and 2x M3 nuts to attach the input motor. 1 X M5 hex-head screw to fit in the output gear. The "lemon shaped" mount fits only the pancake motor. The "turtle shaped" mount which sits atop fits the pancake motor with the two side screws and a NEMA17 flange with the other four. 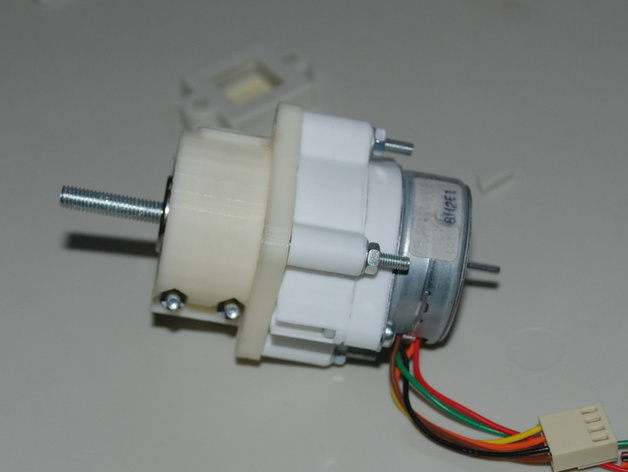 It is pictured attached to my Kossack extruder. Not certain this formula is perfect, though it works for the situations I use it. My design has 13 and 12 teeth on the lower gears, 12 and 11 teeth on the upper, which works out to 144:1. Cycloid code is derived from mattmoses' Cyclodial Speed Reducer.